Fun & Inspiration 5 Signs Indicate You’re Meant for Something Bigger! 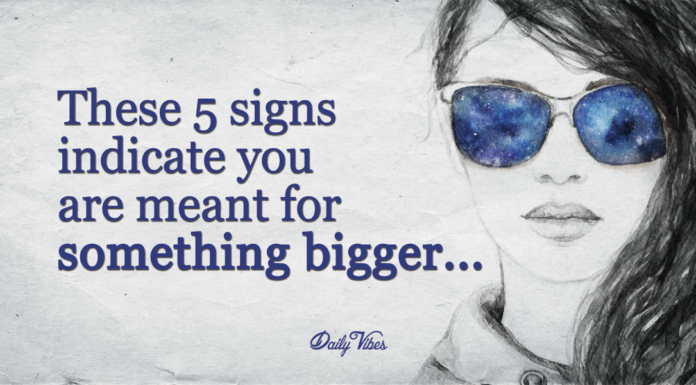 5 Signs Indicate You’re Meant for Something Bigger! Everyone wants to achieve big things in their lives, but only few are actually able to do it. Most people think that if they do nothing, that if they just let destiny take care of it, those big things will happen automatically. This is almost never the case. Even if destiny does have major plans for your future, that future only exists if you actually want those major plans; you have to be willing to work for them. It’s equal parts knowing what you want to do, and then having the drive to go out and do it. If you think you’re destined for big things, check out these five signs that will tell you if you’re meant for something bigger. When someone tells you that you need to do something, it almost makes you feel like doing the complete opposite. If you’ve ever wondered why this is the case, it could be because you aren’t supposed to work for anyone else; you’re supposed to do your own thing. Often, people mistake you for a procrastinator, but you know this isn’t true. You don’t like to start a project until you feel like you’re really inspired to do it. If you were to start something without feeling that perfect amount of inspiration, you know it wouldn’t be your best work. As a kid, work just didn’t make any sense to you. This is because you aren’t supposed to work. There are plenty of children who can’t wait to go to work with their parents on those special days when it’s acceptable, but you wanted to stay home and do your own thing. You don’t need to necessarily be inspired by the outside world because you have your own voice that you’re listening to. Don’t worry about not being able to explain an idea or inspiration, just trust that you know what you’re doing. Having strong feelings is a sign you need to do bigger things with your life. Whatever you’re feeling, you need to trust and listen to. Don’t explain away your feelings as irrational; take the time to listen to what they’re telling you. It could just be what you were always destined to achieve.